A local councillor says removing bins is not the way to discourage illegal dumping. 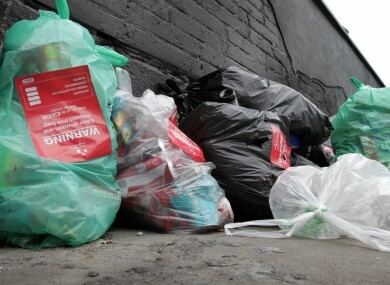 DUBLIN CITY COUNCIL has said that it is not removing litter bins “wholesale” in the fight against illegal dumping. It was responding to Sinn Féin Councillor Noeleen Reilly, who criticised DCC for removing litter bins across the city. She said that “if there are no bins then it gives some people the excuse not to clean it up”. DCC said in a statement that it currently has about 3,300 bins in its administrative area and the number of bins in the city “has not changed significantly in recent years”. Occasionally the city council may remove a bin if it has been abused. The suggestion that there has been wholesale removal of bins in the city centre to combat illegal dumping is simply not correct. It should be noted that the City Council has been working on a new initiative to combat the serious litter/dumping issues in the North Inner City and the latest IBAL (Irish Business Against Litter) report has noted an improvement in the Area. Cllr Reilly said that she and her fellow councillors discussed the issue at length at the recent Northwest area committee. Speaking to TheJournal.ie, she said that the council told councillors it couldn’t say how many bins had been removed. She said councillors told the council they should be advised about any bins that are removed, and that the council said it will inform them going forward. “I think [the council] should tackle illegal dumping but I don’t think they should remove bins,” concluded Cllr Reilly. In 2012, DCC began removing public bins in residential areas, in an attempt to deter people from dumping domestic rubbish. Another Dublin councillor, Noel Rock, said he has been working to get a number of bins retained, as well as new ones installed locally. “Dublin City Council – whose litter workers were out over the entire Christmas period – are amenable to these suggestions and have on occasion implemented them if it makes sense,” he commented, while welcoming the news that the council would be informing councillors about removal of any bins. Email “Dublin City Council denies suggestion it is "wholesale" removing litter bins ”. Feedback on “Dublin City Council denies suggestion it is "wholesale" removing litter bins ”.